Colin and Ben did a great job painting three rooms in our house over three days. They were friendly and polite. The quotes were reasonable. They were happy to change various aspects once we had decided what we wanted, even some aspects on the day. Fixing a date to fit in with other trades involved proved a bit more tricky as they are quite booked up! The quality of the decorating is good. "Colin and his son Ben did an excellent job I would highly recommend them not only did they do a good job but they were they punctual, tidy and finished on time. I would definitely use his services again." "Very pleased with our newly painted house. Colin and Ben painted our house, all rooms including woodwork. They are very meticulous, and have done an excellent job. Colin and Ben are very reliable, punctual, and honest. We are very pleased with their work. Will definitely recommend them to our family and friends. Thank you both." "We were very pleased with the work that Colin and his son did. There was very little mess and dust during the work and I was particularly impressed by the finish on the painted walls, which was achieved without the need for any lining paper." "Colin has just completed the painting of several rooms in my house. He and Ben are reliable, punctual and very tidy and I am delighted with the finished product. I have no hesitation in recommending his services." "Colin has painted the interior and exterior of two of my properties and has done an excellent and clean job. He is very meticulous, reliable and honest. He's gone the extra mile to satisfy my requests in completing the jobs. Colin is also a great handy man. I highly recommend him." "You have done a very good job, thank you." 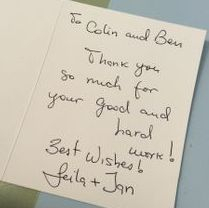 "To Colin and Ben, thank you so much for your good and hard work!" "Thanks to you and Ben for the work you have done, we are v pleased with the hallway and landing." "You and your son did some lovely work for us last year in December..."
"Checked in on the house earlier and it's come up really well and I'm over the moon. Fantastic job. Thank you." 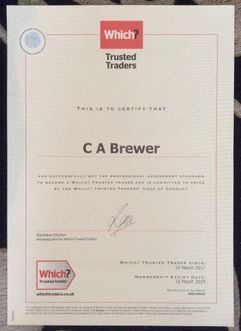 "I found Colin through 'Which Trusted Traders'. That is truly what he is. He turns up early for appointments, listens to what you want, helps with suggestions and does the job well with no supervision. and he communicates without chasing. If only all tradesmen were the same!" "I found Colin’s name on the 'Which Trusted Traders’ list and he and his son certainly fit that description. They decorated our study, bathroom ceiling and front door to a high standard. They arrived on time were finished on time and to budget. They worked cleanly and tidily, I would recommend them and would definitely use them again." "Hi, Colin, just to say that your work, especially the tiling, looks fantastic! Thank you!" "We've just had our house painted throughout, all the ceilings, walls and woodwork, including doors and cupboard doors. Colin and his son worked really hard, they were always punctual, reliable, tidy and quick and have done such a good job! Looking forward to having them back for exterior painting next year!" "Thank you for the wonderful job you made of our lounge decoration. It looks so good. I'm very impressed with both wall papering (no visible joints) and paintwork. Thank you." "It was great, thanks, arrived home yesterday afternoon to a lovely painted house. Thank you so much, it looks great and we are really happy with the result." Thank you again for an excellent job, a job well done. I would recommend you to everyone. Very pleased. "I just wanted to say a big thank you for doing the stairs and landing in several sessions in order not to disrupt my mum too much. We very much appreciated your kindness and flexibility. The job you did with Ben is excellent as usual and we are always impressed by the result." "Really love the bedroom, thank you. It's amazing the difference it's made." "Thanks so much for painting the living room and toilet last week, we love it!" "I contacted Colin a year ago after a recommendation from a friend. So far, Colin and his son Ben have carried out two decorating jobs for me. On both occasions I have found them to be reliable and trustworthy. Not only that, the work has been completed to a high standard, in good time, and with very little disruption or mess. I will be using Colin again and will gladly recommend him to others." "Thank you so much for the work in my entrance, hallway and kitchen. We are delighted with the result, it all looks like new again. You and Ben were so quiet, and quick, we hardly knew you were in the house. I will be recommending your work, as it was recommended to me. "Very happy with the decorating. It is really good for us that in a house full of four legged friends it is all done so quickly with the minimum of disruption!!" "We used Colin to paint our dining room, living room and landing and he did a lovely job, I would absolutely recommend him and we'll be using him for any other decorating needs we have. He worked quickly and neatly and the end result was exactly what we'd hoped for." "Colin Brewer has decorated several rooms in my home over a number of years. He is very reliable and completes all his work to a high standard." "As always, Colin completed the redecoration on time, on budget, and to his usual high standard. We are very pleased with the result." "We have used the decorating services of Colin Brewer for over 20 years, during which time we have never had cause to make a single complaint. He is thorough, professional with a personal touch that makes him a pleasure to deal with. The quality of his work is excellent in all departments and we have no hesitation in recommending him for all types of interior and exterior decorating." "Colin did a wonderful job in my lounge. It is the third room he has been decorating now and each time I am so happy with the result that I want him to do more!" "Colin decorated my daughters bedroom. Colin was very professional and I will contact him for future works." "True to his word the whole home was prepared and painted from ceiling to walls and readied for sale as quoted and photographed. The internet enabled this to be sourced and completed without meeting, as instructions were relayed from Western Canada ! An excellent project well done on time and professional executed. Recommended without hesitation !!" "Colin has decorated our house both inside and out and at all times done a super job. Most recently he has transformed our bedroom and a few weeks ago the kitchen. We wouldn't hesitate to recommend him." "Very happy with Colin's work, he was punctual and very tidy and professional. I have asked for more work to be done in the rest of the house in the new year. Really great to find such a diligent workman." "Colin recently decorated my two downstairs rooms for me after being highly recommended by a friend. They were able to do the job earlier than expected, and were quick and efficient, with no mess. I was really pleased with the quality of the work at what I consider to be a reasonable price - I will definitely be using Colin again and have no hesitation in recommending his services." "I have just seen the beautiful job you did at my daughter's which prompted me to look at my living room.... Incidentally you did my kitchen some five years ago which still looks good!" "Personal, reliable, superb decorator. Have recomended to all my friends and colleagues." "Due to his workload we had to wait a number of weeks for Colin to decorate our lounge, dining room and stairs. The standard of the finished job proved that he was definitely worth waiting for. 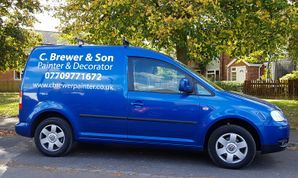 Colin and Ben were polite, friendly, neat and tidy and I would have no hesitation in recommending Colin and Ben to anyone looking for a very good decorator." "We used Colin on a recommendation from a relative and were delighted with his work which was very professional - we have already booked him for another job in the summer." "Colin was recommended to us by a really good friend (who still uses him) and has been decorating for us now for about 20 years. I, in turn have recommended him and he is used by friends and a neighbour too. It is a reflection of his work ethic and professionalism that we have used him for so long, and if he has been unavailable we are prepared to wait until he can fit us in. Colin's quotes are very fair and reasonable and we have never had cause to quibble. He is always on time and works very quickly and efficiently and is super tidy. Another fine quality is his quite unobtrusive presence. I trust him implicitly and do not hesitate to leave him in the house alone." "I would have no hesitation in recommending Colin Brewer for any decorating job. We were very happy with everything he and his son did. It was all completed with the minimum of fuss and no mess for us. They were extremely kind coming very early one day to accommodate our plans." "Sorry I missed you on Friday. I arrived home to a pristine kitchen beautifully decorated. Very many thanks for yet another excellent job from you. I always know I am not going to be disappointed with your work. You tick all the boxes - clean worker, punctual, quick results. You are a true professional Colin, and Peter and I wish we could take you with us to Yorkshire." "We had to wait a while for Colin to paint the outside of our house...this is because he had such a full diary which speaks volumes for itself. We are incredibly pleased with the finished job. He is very meticulous in his work and would highly recommend him to anyone." "Colin has just been in to decorate my lounge and computer room and I am delighted with the result. Colin is 100% trustworthy as I always leave him with a key and I know he just gets on with the job in hand. Colin is very efficient and leaves everything clean and tidy and works in a very methodical way. I would recommend him to anyone who can't be asked to decorate themselves and who want all the stress taken away." "Colin is a true pro and I highly recommend him. His pricing is fair, he is punctual, tidy and fast. He took just 4 days to re-decorate my hall/stairs/landing & Front Bedroom plus coated the bathroom ceiling. 15 rolls of wallpaper were hung, Coved all ceilings and fixed up 3 ceiling roses. All woodwork including doors, frames, sills and skirtings were rubbed down, under-coated and glossed. Ceilings and walls painted. I am delighted with the end result. Thank you Colin. I will be in touch again soon." "Mr Brewer has done decorating for us in the past so we had no hesitation in asking him if he was available to do further work for us again. The rates that he quoted are competitive within the current market. Mr Colin Brewer has just completed the internal redecoration of our house to our complete satisfaction. Colin always arrives in a timely manner and works in a very unobtrusive but friendly manner. Colin is very competent and his careful preparation work leads to a high professional finish when the work is completed." "Colin provides a professional ,clean and tidy service. He has decorated the inside and outside of our house and we are always pleased with the results." "We are delighted with the work Colin Brewer carried out recently on the inside of our property. Colin has also decorated the outside of our property and we were delighted with this job as well. We have always found Colin to be trustworthy and reliable and would not hesitate to recommend him." 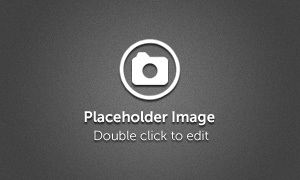 "Thank you for the fantastic job you did last week. You were clean, tidy, efficient and did a good job and would have no hesitation recommending you to anyone." "Collin has now completed several projects for us and we have been exeptionally impressed with his professional approach and the quality of the work he has carried out. I would have no hesitation in recommending him to all as a reliable and trustworth craftsman."